Mary Orvis Marbury’s book, Favorite Flies and Their Histories, 1892, contains information on the wet fly pattern, Queen of the Water. It is pattern No. 195, and the information begins on p. 351 in her book. Marbury writes, “The Queen of the Water is credited to both Professor John Wilson (“Christopher North”) and his brother, the naturalist, Professor James Wilson.” The Wilson brothers were from Scotland. John Wilson also created the Professor wet fly in 1820. It is plausible to assume that the Queen of the Water wet fly pattern is nearly as old. Marbury also writes of a possible connection between the Professor and Queen of the Water, the Professor without the scarlet ibis tail, being very similar to the Queen, except for the palmer hackle on the body of the latter, and a minor variation of the body color. Additional text in Favorite Flies continues: “It is claimed by old fishermen the Professor fly was originally made without the bits of scarlet ibis representing the stylets of an insect, and many experienced fishermen of today cut these fibres of ibis feather off, while others consider the fly useless without them. If, as is asserted, the Professor was first made without them, then there was very little difference between the Professor and the Queen of the Water, except that the body of the latter is of a darker shade of yellow, almost an orange, and the hackle is wound the entire length of the body; therefore it is reasonable to assume the two are only variations of the original fly, which in time came to be known as two distinct patterns.” Most anglers refer to the Queen of the Waters with an “s” on the end. The Carrie Stevens version of the Queen of the Waters streamer was published in Forgotten Flies, Complete Sportsman, 1999. In the chapter titled, The Rangeley Region, Carrie Stevens, and Beyond, there is a fold-out photo gallery page that includes an original Queen of the Waters streamer tied by Carrie Stevens. This fly was another of her wet-fly-streamer conversion patterns, yet the book, Carrie Stevens: Maker of Rangeley Favorite Trout and Salmon Flies, Stackpole Books, 2000, by Graydon and Leslie Hilyard, does not include the Queen of the Waters. Furthermore, the reproduced Queen of the Waters Stevens pattern in the text and photos of Forgotten Flies varies from the photograph of the Stevens original. The reproduced pattern recipe includes a belly of white bucktail, with a body of flat silver tinsel. Careful study of the photo of the original Queen of the Waters tied by Carrie reveals a body of orange floss with a tag and ribbing of flat silver tinsel. 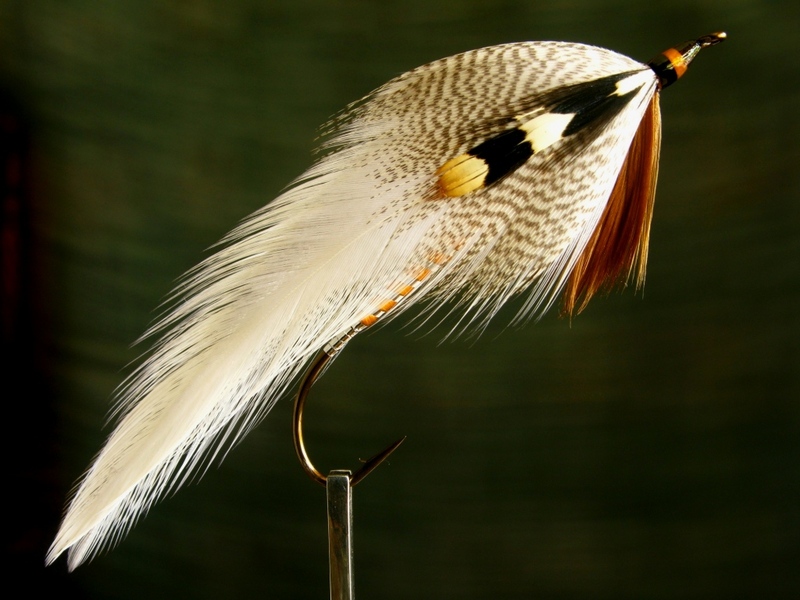 That makes more sense as well, in comparison to the orange floss body on the original wet fly pattern. The old adage, “Seeing is believing,” is relevant in this case. My choice is to believe what I see, rather than place trust in written text that conflicts with what is clearly visible to the eye. The fact that there exists a photograph of an original Queen of the Waters streamer pattern originated and tied by Carrie Stevens, offering the opportunity for visual inspection is good enough for me. Queen of the Waters streamer, Carrie Stevens pattern. The lighting and image may not be great, but it’s kind of like “mood lighting,” or how things may sometimes appear when viewed in dim light. Queen of the Waters – the hook is a size #2 – 8x long – Gaelic Supreme Martinek / Stevens Rangeley Style Streamer. This topic is the result of one of my subscribers in England writing to ask if I knew any history of a Queen of the Waters streamer pattern. I had remembered the pattern being included in Forgotten Flies, and we exchanged some correspondence on the subject. The end result was I decided to tie this pattern and post it here. Thank you Darrell! Queen of the Waters – tied and photographed by Don Bastian. Forgotten Flies lists the head band color as red, and while it is difficult to confirm this from the photograph of Carrie’s fly, I believe the band is orange, which again, seems to go hand-in-hand with the body color of her version of this traditional wet fly pattern. By the way, the recent Stevens streamers published here, the Donald Bartlett series, and this fly, have head cement of clear Pro Lak (available in Canada). It seems to go on with no bubbles and no discoloration, but it does take five coats. That is worth the time if it holds up well. Brook trout and landlocked salmon seem to be attracted to many predominantly white streamers and bucktail patterns. I have never tied (or fished) this pattern prior to tying this first specimen shown here, but like so many other flies, it would most likely fish well. 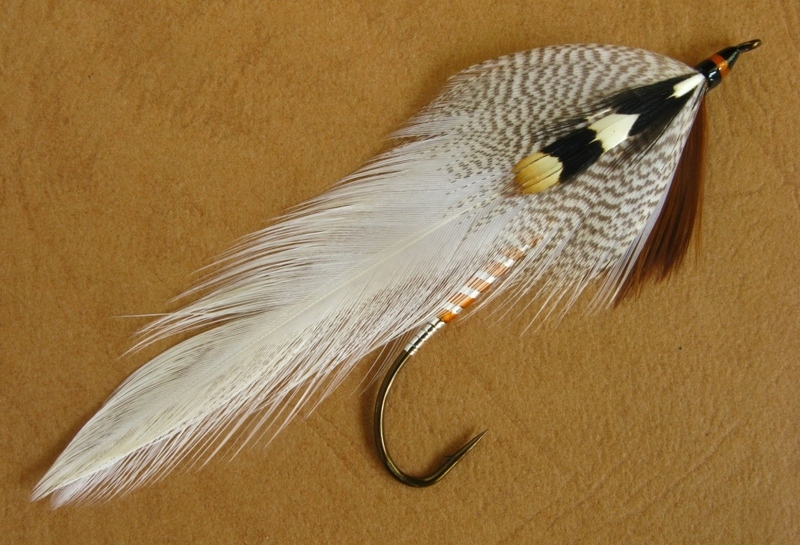 This pattern is a very popular old standard wet fly. It is listed in Mary Orvis Marbury’s Favorite Flies and Their Histories, 1892. I fished it often as a kid and a young man. This was part of the custom order I received in the summer of 2009 from Fishing Creek Angler Fly Shop and Bed and Breakfast, near Benton, Pennsylvania. Hook: Standard ox long wet fly hook, sizes #4 to #12 as desired. 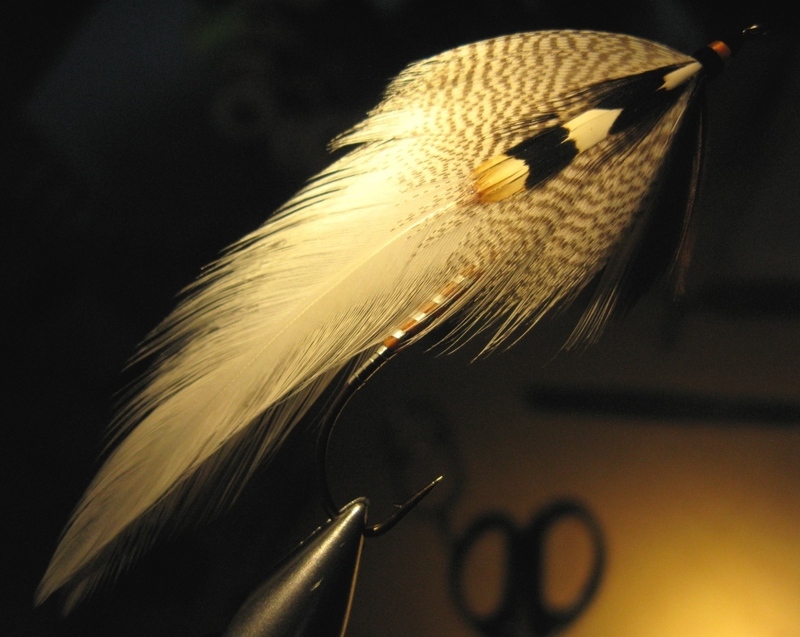 Hackle: Brown hen tied palmer, the soft webby fibers near the base of saddle hackles may also be used. depending on the density of the hackles barbs, you may decide to strip one side of the stem before winding.